Last summer I was contacted by Teresa Silva and Paulo Matos who having purchased 28 ha (70 acres) of land in Beja, Portugal are looking towards establishing a regenerative enterprise/homestead on the property. The brief was to analyse the site and identify the potential of the land for future regenerative development. As always it was a pleasure to be working with Georgi Pavlov – www.georgipavlov.net on this project. During this blog I’ll go through our broad design process and then present the design concept we came up with for this site. The process starts with a conversation with Teresa and Paulo to gain an understanding of their circumstances and to establish their broad objectives. This is followed up with a questionnaire for them to complete in their own time in order to gather more details about the land and their lifestyle. This information is used as a starting point for deeper research and to clarify the design objectives. From the DTM we extracted slope, aspect, elevation, water flow and topography data and exported these to layers on Google Earth. This is a great way to quickly overview the site and identify extremes in the landscape. The next step is identifying the site potential for water harvesting, locating optimal locations for reservoirs/ponds and riparian zones and putting in place access routes within the landscape. The main vehicular access for this site was already well established so we stuck with the existing tracks or slightly modified/extended them. This results in a landscape divided into various zones. We then take each zone and analyse it further as separate unit of design. Below you’ll find a list of these zones and a brief description of the potential cultivation practices or other uses we selected for them. Teresa and Paulo already had plans for a house and the location selected and we added other elements into this zone based on their requirements for a kitchen garden, animal housing, recreational/learning areas and field crops. House and Surroundings – The house, car parking, children’s play area, outside kitchen, herb garden, decorative planting schemes, farm building to store tools/machinery/produce/materials and animal housing with space around the structure for material storage. Fields – The fields can be used for biomass production for use as mulch within the orchard and market gardens, grain production and pasture for animals. Forest Garden – A diverse mix of perennial plants that can provide fruits, nuts, herbs, medicine, materials, a place of relaxation and learning, and wildlife habitat. Living Fence – A hedge around the east and west boundaries of the area can provide privacy and security as well as habitat for wildlife and produce for the farm. Ponds/Reservoirs – Water harvested from the roofs, tracks and surface runoff during storm events can be stored open in ponds or closed in tanks. Kitchen/Market Garden – This area is suitable for a polytunnel, a greenhouse and raised beds for crop/mulch/fodder production. Fowl can be integrated into this area using mobile coops to fertilise the beds and build soil. Another objective was to grow fruit crops for market and plans were already available from a local agronomist for monoculture almonds and pomegranates on a grid layout. Guided by the topography of the site, we established a planting pattern that encourages an even distribution of rainfall (i.e surface runoff) across the site, reducing erosion and the occurrence of dry and wet areas. On the left the Keyline Layout and on the right an illustration of how tree rows would look on such a layout. We selected a 6 m x 6 m planting scheme for the orchard in order to support rootstock and cultivar selection that are less water needy, show higher resistance to pests and diseases and need less nutrient inputs whilst still providing high yields. A 6 m x 6 m layout also allows space for the inter planting of nitrogen fixing shrubs and pollination support species, and requires less water than a more intensive planting scheme. Primary Crop – Pomegranate Trees spaced at 6 x 6 with intercrop of nitrogen fixing shrubs planted between trees. 2 – 3 cultivars required for optimal production. Secondary Crop Citrus – Citrus trees share similar soil and nutrient requirements as pomegranates and can be planted in alternate rows (subject to production goals). Pollination Support Islands – Wildflower island that encourage pollinating insects around the trees can be sown between the tree crops in every 10th row. Remnant Olives – Old olives trees that match up with the planting pattern and do not obstruct the new layout can be left for beneficial habitat and diversity – up to 8 trees. Alley Cropping Silvopasture – Poultry can free range in the orchard during the spring and autumn when herbaceous growth is lush to help control weeds and fertilise the trees. Concentrating the flocks in paddocks with electric fencing will encourage better weeding and fertility inputs. Primary Crop – Almond trees spaced at 6 x 6 with intercrop of nitrogen fixing shrubs planted between trees. 2 – 3 cultivars required for optimal production. Secondary Crop Fig – Some of the rows can be planted with fig cultivars to break up the monoculture of peach and add a further crop to production. Pollination Support Islands – Wildflower island that encourage pollinating insects around the trees can be sown between each tree every 10th row. Alley Cropping Silvopasture – Poultry can free range in the orchard during the spring and autumn when herbaceous growth is lush to help control weeds and fertilise the trees. Concentrating the flocks in paddocks with electric fencing will encourage better weeding and fertility results. Biomass Production – Aquatic grasses grown for mulch for use in orchards and market garden. Ponds – A series of stream fed wildlife ponds for general ecosystem support and biomass production. Fowl – Geese and Ducks can be kept in this area. Forestry – Wetland timber/biomass/fodder trees. Wild zone – Portion of land left to naturally succeed. Managed Succession – Areas of the riparian zone can be managed in successional sequence to optimise the biodiversity associated with each successional stage. The areas highlighted below are natural Holm Oak Savannah typical of the region, and are protected zones. Grazing in the protected zones is permitted as is planting of new tree species. Swales with crops – A series of swales can be established within the wild zones. The swales will better distribute rainfall surface runoff across the slopes, reducing the current erosion and can serve as planting zones to a number of native species that can be used for fodder to free ranging animals. Apiculture – Native bee trees, shrubs and herbs that provide a succession of pollen and nectar can be planted along the swales to attract a range of pollinating insects that will also help pollinate the main orchard crops. There is also potential for honey production on the site once the plants have established. Grazing Paddocks – Temporary paddocks can be established on a rotation cycle used for grazing animals. Swale plantations can focus on high value animal fodder crops. Forestry – Drought tolerant timber/biomass/fodder trees can be planted to fill out the current savannah planting pattern of the protected zones. Wild zone – Portion of land left to naturally succeed without disturbance. Beneficial Habitat – Habitat for pest predators, cover for nesting birds. Managed Succession – Areas of the protected zone can be managed in successional sequence to optimise the biodiversity associated with each successional stage. Tracks – Modify tracks to shed water into cultivation zones or avenue plantings to prevent erosion and increase plant productivity. Living Fence – Hedging can be established along the non fenced boundaries of the site using drought tolerant native species. Headlands – Tracks around and within the orchards to allow turning of machinery. 1m wide strips along the sides of the headlands can be sown with perennial herbs that provide nectar and pollen to pollinators. Water Harvesting Channels – Where rainwater surface runoff is apparent, channels on the sides of the road can be made to divert this water to avenue trees or nearby crops. Grassy Banks – Earth moved from the excavation of water channels can be used to build mounds that can be sown with native grasses (or allowed to naturally succeed). These mounds are used as nesting sites by a number of species of ground dwelling solitary bees that assist with pollination. Avenue Trees – Drought tolerant, pioneer (nitrogen fixing) trees can be planted along the access tracks. Can be used for biomass, animal fodder, bee fodder and timber. 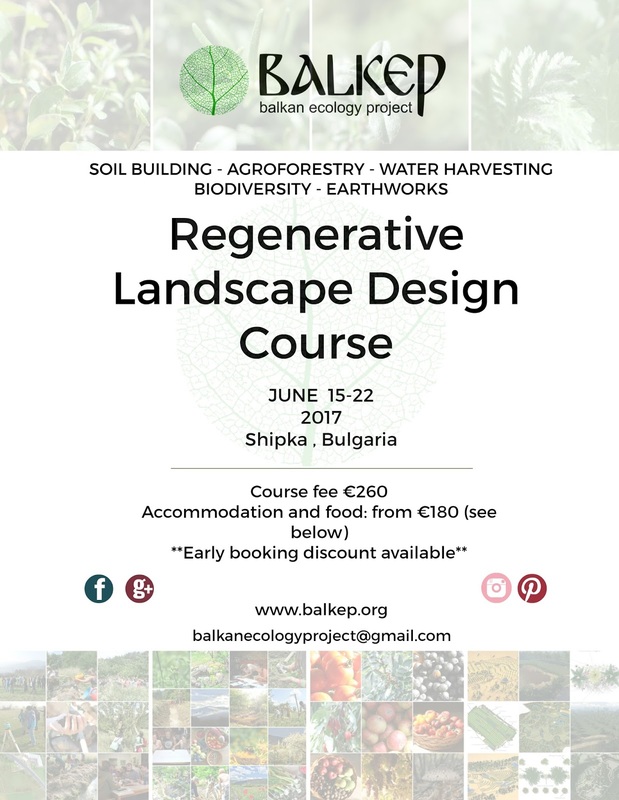 If you would like to find out more about our design process you can join us for our Regenerative Landscape Design Course coming up this June. Here’s a list of general resources available online that you can use for initial site analysis. Digital Terrian Model – Here’s a list of companies that provide DTM. We can also provide DTMs and data extraction for most European countries so if you are interested please send an email to – balkanecologyproject@gmail.com with a polygon of your site highlighted on Google Earth and we’ll provide you with a quote. The Layout Process – Georgi has some great info on his face book page going through step by step the layout process and you can find a range of courses on his webpage.